Turns out the Stream 14 wasn't the only affordable(ish) device HP had cooking, though its latest offerings are decidedly cheaper, smaller and less Chromebook-rivaling than the last one. The company is out with a duo of tablets and a pair of laptops running Windows and carrying the Stream name to less sizeable screen sizes. The HP Stream 7 and Stream 8 are Windows tabs with display girths to match their names. Intel processors tick inside. HP didn't cough up many other details, though Engadget has word the tablets feature 32GB of on-board storage, a microSD slot to expand, 1GB of RAM and Bluetooth 4.0. Both tablets come with a one-year Microsoft Office 365 Personal subscription, including 1TB of OneDrive online storage and 60 Skype minutes/month. Stream 8 owners will have an optional 200MB of free 4G data to play with if they choose for as long as their tablet is kicking, no contract required. The Stream 7 starts at $99.99 (about £61, AU$114) while the Stream 8 price begins at $149.99 (about £91, AU$171. Both tablets will be available in the US sometime in November. As for the keyboard-fitted Stream devices, HP introduced laptops with 11.6- and 13.3-inch displays. The machines are flush with touch-optional HD displays and a fanless design. An Intel Celeron processor hums in both machines' inner chambers, and each counts 32GB of eMMC flash memory on its spec sheet. They will apparently feature 2GB of RAM, an Intel HD graphics card and boast a one-charge lifespan of 8.5 hours. 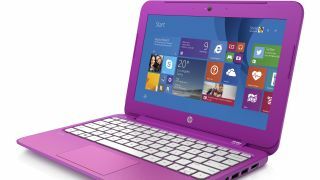 For better or worse, the Stream laptops come in either Orchid Magenta or Horizon Blue because, "Who doesn't love color?" as the Windows blog wonders. Like their tablet cohorts, the Stream laptops comes with one year of Office 365 personal, 1TB of OneDrive online storage included. There's also a $25 gift card in the box because Microsoft REALLY wants you to buy its Windows Store apps. The 11.6-inch Stream laptop starts at $199.99 (about £123, AU$229) and the 13.3-inch will get buyers going at $229.99 (about £141, AU$264). They too will be available stateside in November.